3 bedroomed air-conditioned house. Free Wi-Fi. Shared pool. Private roof terrace, patios & garden. Shops, bars and restaurants within walking distance. Icarus House was completed in January 2005. It is a three bedroomed house occupying a corner position. It boasts a roof terrace, a balcony, two patios, small garden areas on three sides and private off road parking. Inside there is air-conditioning in all the bedrooms and in the lounge/dining area. The units double up as heaters for the cooler winter evenings, and there are halogen heaters too, should they be required. These rooms also have ceiling fans. The tiled roof terrace has sun loungers and chairs, with a good view over the swimming pool. From the roof terrace an internal marble stair case leads down to the first floor, where the three bedrooms all have built-in cupboards with drawers and hanging space (and hangers). There is a balcony leading from the main bedroom. There is also a family bathroom on this floor as well as a shower enclosure and additional toilet on the ground floor. The lounge area has two leather sofas, 2 armchairs, coffee tables, a TV with many channels (via Internet) & a DVD player. The dining table seats six, but extends to accommodate eight easily. Sliding glass doors lead from both lounge and dining areas to outside patio areas. The kitchen has granite worktops, a dishwasher, microwave, washing machine, fridge/freezer, oven, induction hob, extractor hood, kettle, coffee machine and toaster as well as plenty of glasses, crockery, cutlery, pans and utensils. There is also a washing line and pegs, an iron and ironing board and hairdryers. Both side and rear patios are sheltered by hibiscus hedges for greater privacy, and the garden area has gates so your small children cannot wander off into the nearby swimming pool. The property is situated in a mainly residential area it is within walking distance of numerous bars, restaurants, shops etc. but far enough away from the hustle and bustle to allow a peaceful nights sleep. Hire of a baby cot and high chair is possible. One of the many great things about Paphos as a holiday destination is the short transfer time from the airport. We can arrange for a taxi to pick you up at the airport. There is also a bus from the airport to Paphos, which is very reasonable, but does not take you door to door. On average the sun shines for between 320 and 340 days a year in Cyprus (depending on which web-site you look at). However, Cyprus is not just about sun-bathing. Why not come in spring, when the weather is pleasant, if not hot, but ideal for hiking, and for visiting the many sites of historical interest whilst they are less crowded. Don't worry if your Greek is not great, as most of the locals speak English. 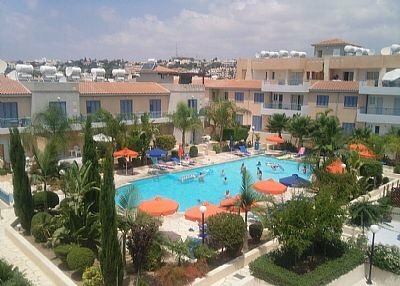 Driving is on the left and electricity is 240 volts with 13amp square pin plugs just like U.K.
Activities in and around Paphos include swimming, scuba diving, water-skiing, and other watersports, horse-riding, golf, tennis, bowling, walking, cycling. There are lots of places to visit, especially if you like ancient ruins or Byzantine churches. There's also lots for the nature lover. Loggerhead and Greenback Turtles nest on the beaches on the Akamas peninsular, and the rare moufflon may be glimpsed on the forested slopes of the Troodos mountains if you are lucky. You don't need to hire a car as our house is within walking distance of both Kato Pafos and Upper Pafos. There are bus stops and convenience stores within a few minutes walk of the house. Kato Pafos is the more touristy area, with numerous restaurants and bars, etc. Nightlife is good, with plenty of bars and clubs staying open until the early hours. There's a picturesque harbour with views to the old fort. There's a wealth of ancient ruins - visit the rock tombs or see the ancient mosaics at the House of Dionysis. In Upper Pafos there are more banks, shops and cafes and a there are markets catering for both locals and tourists. Upper Pafos has recently had a lot of refurbishment with new pedestrian areas, coffee shops etc. Local tour agents can arrange a variety of outings - coach or mini-bus trips to the many places of interest, jeep safaris, donkey rides, boat trips, mini-cruises etc. If you do want the independence of your own hire car, then you can visit more of Cyprus at your own pace, and whilst not necessary is recommended to get more out of your holiday. There are good roads between the major towns, but for some areas a four-wheel drive would be more suitable.